Advertisements for the event were printed and provided to the local elementary school. 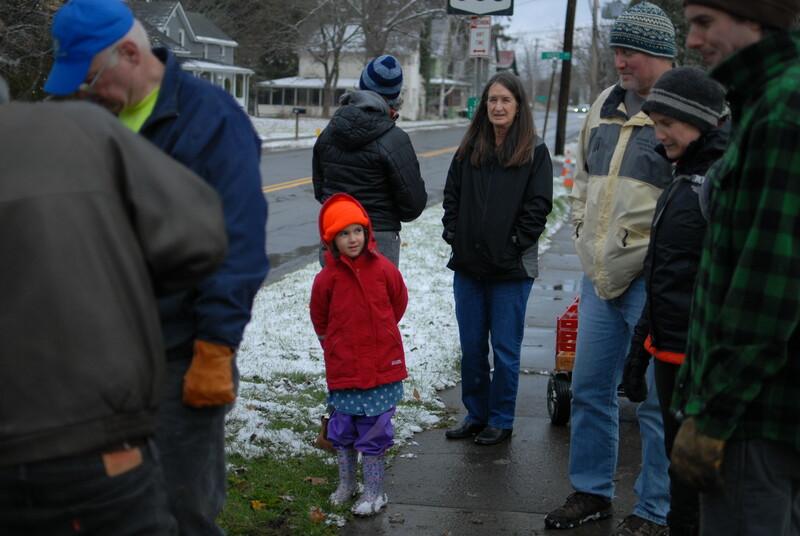 An announcement was posted (and re-posted) on the Village listserv (reaching approximately 300 subscribers) and a local newspaper made mention of the event. 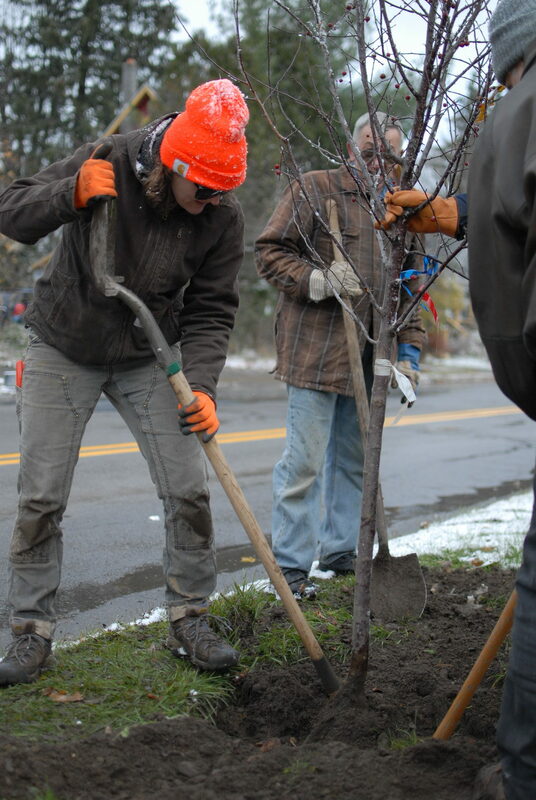 Planting a bare root ‘Karpick’ red maple with Ithaca City Forester Jeanne Grace (left). 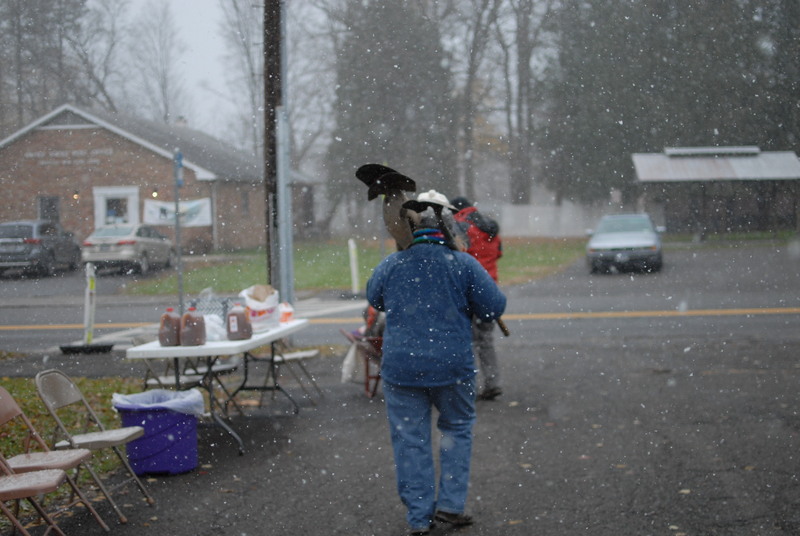 Our event participation was certainly limited by the winter-like weather we experienced the day of the event (temperatures in the low 30s, with blowing snow totaling a couple of inches) but we still had 12-15 people on hand to make the job fun and easy. Some of us decided to dedicate our event to victims of the violence that is so common today, recently to include those of the Tree of Life Synagogue and Thousand Oaks, CA, and in doing so, we honored them with a moment of silence. Getting bark mulch for the newly planted trees. After a brief welcome, we began with a demonstration on correct bare-root tree planting by Ithaca City Forester Jeanne Grace, our Tree Committee adviser (Jeanne also managed the Dig Safe-NY scheduling and permits prior to the planting). Refreshments were provided by Tree Committee members. 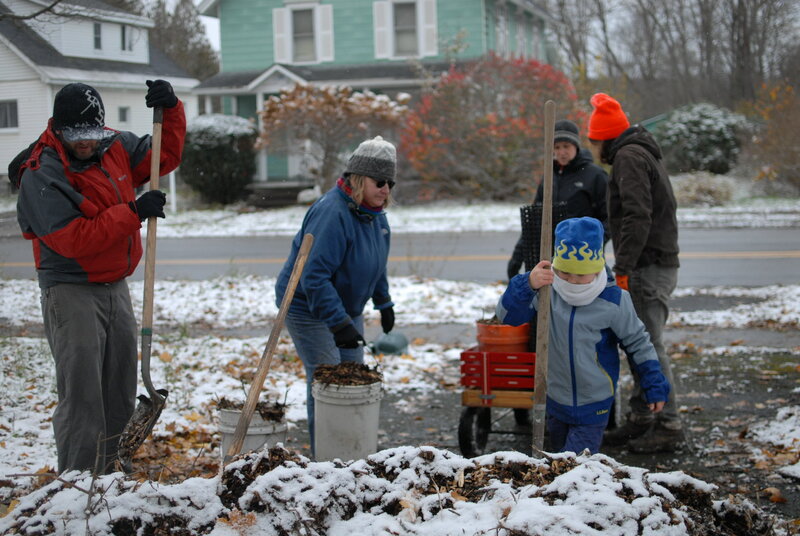 From that point, the participants worked well as a group to quickly plant 11 crabapples and 3 hardwood trees on two main Village streets. Due to the cold temperatures, people stayed as long as they were able and a small number of core Tree Committee members finished the work. We had the good fortune of having Paul Paradine, a forester for NYSEG and Freeville Tree Committee member, arrange for the funding for 6 of crabapples so this allowed us to maximize the funding provided us by the NYSUFC for trees, watering bags, and trunk protectors. It was good planting weather, snowflakes and all. Sometime in January, we’ll have a planning meeting to discuss goals for 2019 and put together a tentative program for the spring. In closing, I’ll take the opportunity to reiterate our thanks for being selected for participation in the Arbor Day Community Grant program. 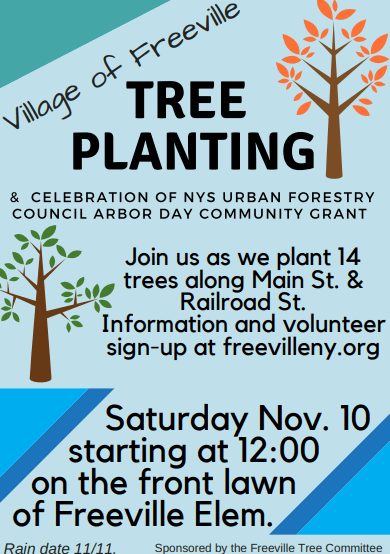 I feel confident that it provided the spark the Village of Freeville needed to initiate an annual tree planting program.